You can’t be living in Mumbai and miss the Ganpati Festival. It’s everywhere! Pandals, mandals, darshan, aartis, visarjans take over the city for the time “Bappa” is here. And Instagram gets flooded with pictures of traditional food that is offered to this God, who is the original Foodie. In fact, I really do feel that for all his love for sweets and good food, Ganpati should be made the official God of all Food Bloggers, Food Writers and Critics. If nothing else, his blessings would make them less inclined to chew on each other. I go off track here. Must be the dhol competing with the loud DJ music playing at the next door pandals. Coming back to Ganpati and his well-known love for food. Husband and I went and ate at the Renaissance MumbaiConvention Centre Hotel. 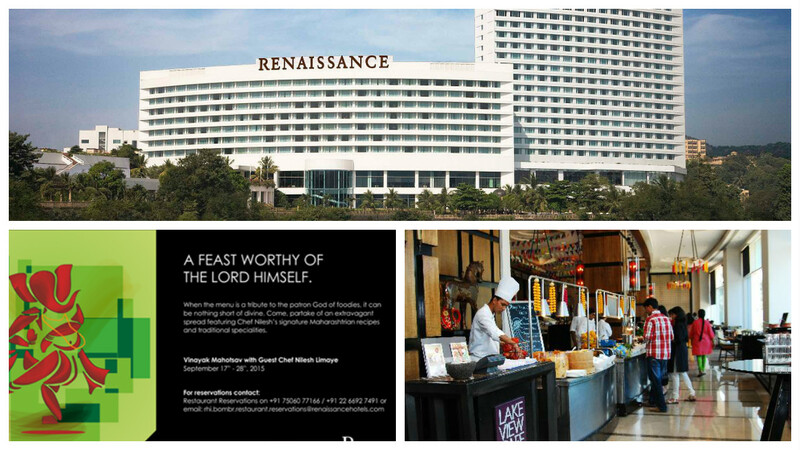 The hotel is serving, just for the Ganesh Chaturthi, a special menu, in association with Chef Nilesh Limaye. This was no regular, sanitised, watered down version of the traditional Maharashtrian food that the menu promised. These were earthy flavours, true to their spirit. We started our meal with Kothimbir Wadi, made into finger food, accompanied with spicy garlic that felt as if it had been roasted on a village chulha. This was followed by a Misal Pav station which, incredibly, followed the Khauswey format, giving you the freedom to create your own combination of condiments and toppings for the missal. The Kesar Sherbat and Thandai were appropriately refreshing companions for what was promising to be a rustic, wholesome and spirited meal. The spread included potato cooked in chilli, gharghuti (home style) mixed vegetables, plain rice with amti dal (superlative is the word), aalu-methi bhaji, Kolhapuri mutton gravy, and the fabulous Tambda Rassa and Pandhra Rassa duo served with Jowar Bhakhri. I hear you. All this isn’t the regular fine dining fare you are used to hearing and reading about. You are right. This is the true-blue Maharashtrian cuisine, unpretentious, rich and intense in its flavours and to be had with an open mind, and open heart, and a very strong appetite. As if the flavours of the food weren't enough to keep us dreamy and grinning, there is a dessert counter with more Modak flavours than I have ever had, and some delightful varities of Shrikhand. I feasted, predictably, on Orange Shrikhand because it’s my favourite flavour, and nothing stands unharmed between me and anything citrusy. So there. Husband and I also got a chance to chat up with the celebrated Chef Nilesh, and an interesting conversation followed - full of mutual love for food, and nostalgia for Mumbai as it once was. The Ganpati Festival Menu is on till 28th September, at the Lake View Cafe, so you really don’t have much time. I’d say, go for it. It’s a very unique collection of flavours you don’t want to miss.